Oakland, Calif. – May 12, 2015 – Livescribe Inc. (www.livescribe.com), the leading manufacturer of smartpens, launched the Android version of the Livescribe+ app globally today, opening up the award-winning Livescribe 3 smartpen to millions of Android smartphone and tablet owners. 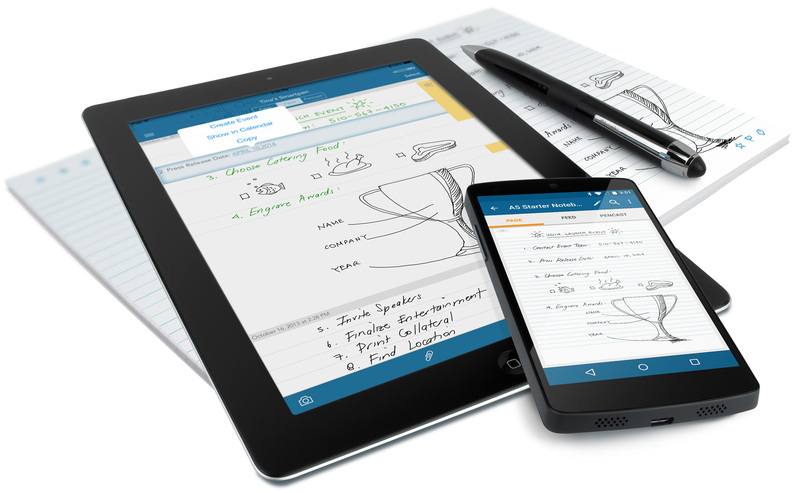 Android users can start digitizing, searching and sharing their handwritten notes by picking up a Livescribe 3 smartpen and downloading the Livescribe+ app, free on the Google Play store. Initially launched for iOS, Livescribe+ for Android has been optimized for Android by incorporating Google’s Material Design guidelines to introduce a unique Android approach to the app’s core functions and user experience. One Livescribe 3 smartpen can sync with up to four iOS and Android devices, so people can access the same notes whenever they need them, on their iPad as well as their Android smartphone, or any other combination of iOS and Android mobile devices. Livescribe+ and the Livescribe 3 smartpen are compatible with devices running Android OS v4.4.2 (KitKat) or newer, with support for Bluetooth® Smart (aka Bluetooth 4.0 low energy). The Livescribe 3 smartpen uses Bluetooth Smart to easily connect to multiple devices and deliver up to 14 hours of continuous writing on one charge. The Livescribe 3 smartpen is an elegant writing instrument that has already proven to be irreplaceable to many professionals and students during client-facing meetings, briefings and lectures. With the Livescribe+ app, every handwritten note is digitized so that it’s more useful than ever – people can save, search and share their notes via the apps and services they already use and love, including Evernote, Microsoft OneNote, Dropbox, Google Drive and more. This allows people to continue working how they want to work, and to be as productive as possible throughout the day. Customers will be able to share their notes with other apps that support PDF files, images or text. The Evernote and Microsoft OneNote Auto-Send feature, which automatically sends notes directly to those cloud services, is currently available in the iOS version of Livescribe+, and will be added to Android in the future. Unique to Android, Livescribe has also launched a second app called Livescribe Link, an Android Service app that manages the connection between smartpen and Livescribe+ and, in the future, other third-party apps that make use of Livescribe’s Android SDK. It also conducts a compatibility check when it’s installed, so potential customers can make sure their Android device is compatible before they purchase a smartpen. The Livescribe 3 smartpen is available for $149.95 (USD) or $199.95 (Pro edition) in the US at http://store.livescribe.com, Amazon, Apple.com, Best Buy, Fry’s, NewEgg.com, Paradise Pen, Sprint and T-Mobile, as well as London Drugs and SmartpenCentral.com in Canada. In Europe and elsewhere, Livescribe smartpens are available at Amazon and Apple.com. For the next two weeks, US customers will receive a $25 Bonus credit towards future purchase with every Livescribe 3 they buy at the Livescribe Store. Best Buy, Amazon and others will have similar offers. Livescribe brings notes, words and ideas to life. Livescribe smartpens make it easy to connect paper and pen to the digital world and fundamentally change the way people capture, access and share what they write, draw and hear. Livescribe’s family of smartpens includes the Echo smartpen, the Sky wifi smartpen and the Livescribe 3 smartpen. For more information, please visit http://www.livescribe.com. TriplePoint PR, for Livescribe, Inc.